Welfare of Stray Dogs (WSD) is a Mumbai-based non-profit organization which provides care and relief mainly to dogs and cats. Since 1994, WSD has carried out several mass sterilization and immunization programs for stray dogs in Mumbai. With very few dogs remaining to be sterilized and immunized, WSD has begun to focus on cats as well. WSD has leased a municipal dog pound from Brihanmumbai Municipal Corporation in Mahalaxmi, Mumbai. This centre has the capacity to accommodate and treat 250-300 dogs per month. WSD follows the guidelines laid down by the World Health Organization and the Animal Welfare Board of India. WSD also conducts 30-40 cat sterilizations per day and has a vaccination program every Saturday for both dogs and cats. The organization under its ‘Education and Awareness’ program organizes workshops for animal lovers twice a year. WSD had recently petitioned the Ministry of Corporate Affairs to include Animal Welfare spend as a specified CSR activity. WSD is awaiting response from the Ministry. In the 20 years of its existence, WSD has reached out to 120,000 stray dogs through sterilization, vaccination, healthcare and adoption. It carries out mass immunization programs of re-vaccinating stray dogs against rabies. More than 40,000 such cases were treated in FY13. 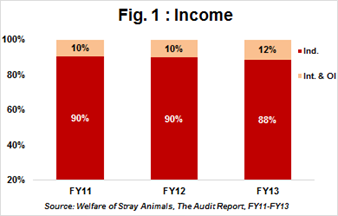 Around 70,000 stray dogs were provided on-site treatment through the on-site first-aid program in FY13. WSD also conducts rabies awareness drives in public places like railway stations and parks. Under the adoption project, WSD finds homes for pets that are abandoned or strays that need a home. In FY13, over 450 pets and stray dogs were handed over to adopters. WSD’s remarkable contribution in reducing the number of deaths in the city due to rabies has been well appreciated by the state government. Research shows that only one person died last year (CY2013). WSD shared that the death count was nil until November 2014. WSD’s total income advanced by 16% YoY in FY13 to Rs6.8mn in FY13. Based on our interaction with WSD, we understand that majority of donations was received from individual donors. The exact breakup of total income is awaited from WSD. WSD organizes garage sales, distributes annual calendars to their donors as a part of its fund raising activities. The annual calendars are sold for Rs150 each and are distributed to about 2,000 well-wishers of WSD. The printing of calendars is done by a committed individual donor. Full proceeds from the sales of the calendar goes to WSD. Similarly, the cost of raising funds through garage sales was also zero, as the premises where the sales take place is offered free by another committed donor. Proceeds from both, garage sales and calendar sales were included in general donations for past three years. In addition to rising donations, WSD’s interest income also grew by an impressive 35% YoY in FY13. This is owing to 14% YoY increase in investments. 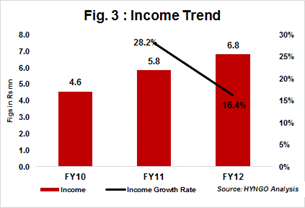 In FY13, interest income accounted for 12% of total income. WSD’s spend on Direct Program Cost increased from 88% in FY12 to 94% in FY13. 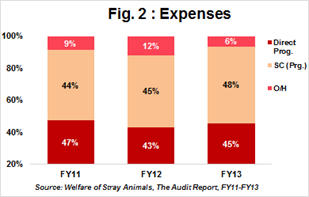 The direct spend of 94% on direct beneficiaries in FY13 includes 43% on providing medical aid to stray dogs and cats, 48% on Program Staff costs and 3% on travel expenses. The high expense on program staff is justifiable as the NGO works for animal welfare & it requires skilled and professional manpower. This also includes surgeon’s fees. (Ref. Fig. 2). WSD’s Trust Corpus strengthened further by increasing from Rs5.6mn in FY11 to Rs7.9mn in FY13. Increase in investment can partly be attributed to an increase in trust corpus, which in turn improved the contribution from interest income in FY13. WSD has reported a 22% CAGR in its income in the past 2-years (FY11-13). This is mainly attributable to the consistency in general donations (Ref. Fig. 3). Self Sufficiency Ratio (SSR) has always been strong in WSD’s case. In FY14, it posted a healthy figure of 118%. SSR shows an organization’s ability to meet its expenses from its own income (general donations, sales, service charges and interest). We calculated the total assets to expenses ratio to find out WSD’s sustainability position. This ratio for FY13 was 1.9x, conveying that WSD owns total assets whose value is twice that of total expenses incurred in the same year. This is an important sustainability parameter as it suggests that the value of total assets, when liquidated can meet the total expenses during a financial crunch. Space constraint. The facility at Mahalaxmi doesn’t offer enough space to provide medical aid to cats. To address this, the organisation is talking to Plants and Animal Lovers' Society (PALS), a Colaba-based non-profit to take over their underutilized facility for stray animals. Lack of infrastructure to accommodate requests from all over Mumbai, Navi Mumbai and Thane districts. To overcome this, a cohort of NGOs working in the animal welfare space have come together to set up a common 24x7 helpline. This would offer available space for admitting stray animals depending on its location. There is hardly any other source of income, apart from general donations. WSD needs to take a proactive approach to widen its income sources and try to get funds from corporates, government or foreign sources. The Board consists of four trustees. Two of four trustees are actively involved in the operations of WSD. The Board of Trustees meet twice a year. The quorum set is three. The operations at WSD is spearheaded by the CEO Mr. Abodh Aras. He had been volunteering with WSD for several years before being appointed by the Board as the CEO. He has been associated with WSD for over 13 years. Abodh is also a member on the Board of Federation of Indian Animal Protection Organisation (FIAPO), apex body for animal protection in India.